Does the above ring a bell? Remember the heart beat or pulse monitoring machine? This is the kind of thing they display (roughly speaking). A wave is a phenomena that carries information or a signal. Sound Waves are one such example. So are Light or Radio waves. 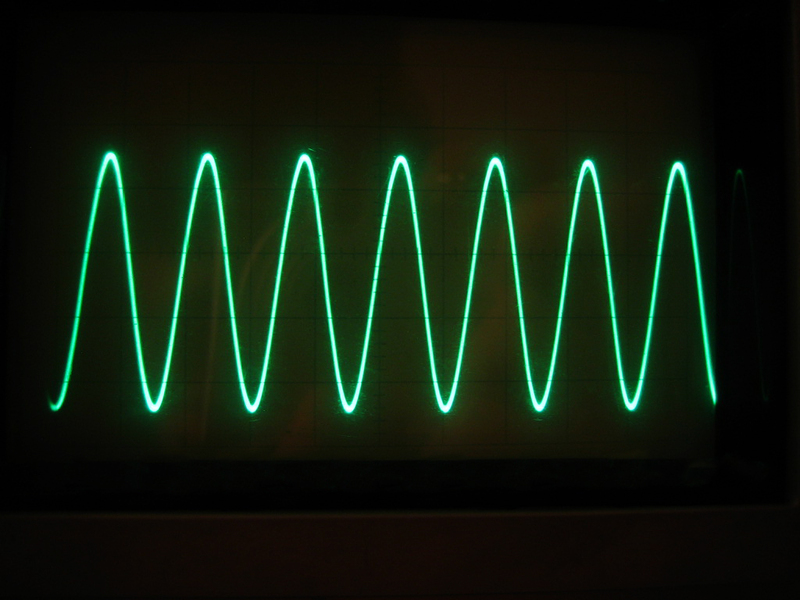 The essence of a sine wave is this: It has crests and troughs or you could call them simply as ups and downs; or to and fro motion about an axis. Mathematically ANY Wave function can be represented as a sum of some sine waves. Let’s see how we arrive at the ups and downs. Take the heart for instance. For simplicity let’s think it’s spherical with a radius. It pumps blood so it is constantly bulging as well as compressing itself…there are cycles. There is a normal state of the heart ( in which it is just it’s proper size neither expanding nor contracting) around which the cycles happen . Let’s say I am able to catch the heart ( not literally ) at it’s normal position on an instant where it is expanding. I call this as my start time or t=0. I will now measure the radius of the heart at this instant. And I will measure the radius of the heart an instant (making a note of the instance) later and as expected the radius will be larger ( since the heart is expanding). An instant later the heart will be bigger and hence my radius will be too…and this goes on until the heart reaches the peak of the wave ( or Up). Next it begins to compress so the radius falls until it’s normal position after which it continues to fall because the heart is now shrinking even more than it’s normal until it reaches a minimum where the heart and the radius are at the smallest and this marks the lowest peak ( or Down ). After this point the heart begins to grow again and so on. If you were to plot the radius of the heart now V/S time you would get a sine wave! Note: This is not to say that this is what hospital machines display. No one is interested in the radius. It displays the electrical activity but the concept is similar. I have taken a few liberties like assuming the heart is a sphere but yeah I am just trying to get the concept across. Ups and Downs, Downs and Ups. Cycles. Hmm. If in a similar way I were to plot the intensity of light at different points of the day. Then I would get say sometime where the sun’s light is brightest (i.e the Up…Mostly some time during mid day ) and sometime at night when the light is absent or it is the darkest (i.e the Down… Around midnight) and the other values would be in between. So if I plot this data I might roughly arrive at…the sine wave! It is all around us really. The Day and Night Cycle. The Breath. The Heartbeat. The Pulse. The Tides of the sea. The Light waves. The Sound waves. They are all the variation of some sort of sine wave or simply a wave. And perhaps this phenomenon is internalized within us in multitude ways. Perhaps this logic could be extrapolated to ourselves? Our states of mind perhaps? The highs and lows. Happiness perhaps? Highs and Lows. So luckily it means that if we are down for a while it wont be long before a UP wave hits us and life becomes good! So keep going! ( Of course we should be vary of the other way around…and not be carried away completely when we have our highs!) . In another sense it is a law of averages. Everything evens out. As an optimist I would hope for highs everyday but the fact also is – it has not happened (yet). But of course I will keep trying! I am likely going overboard with this (which is perhaps the point of a blog). But while we are at it let’s make a daring speculation: Do we experience the highs simply because we had the lows before and we will have the lows after. And we are experiencing a low simply because what follows will be a high…and for it to be a high this has to be a low. I know…too general and taking too many liberties but something to think about. If everyday was the same would there be highs and lows? This entry was posted in Fun with Physics, Physics and tagged Cycle, Day-Night, Heartbeat, Life, Math, Physics, Pulse, Speculation, Wave on October 28, 2014 by iluvryuzaki.